High Volume Fly Ash Extracting Alpha Industries Ltd.Alpha Industries Ltd. 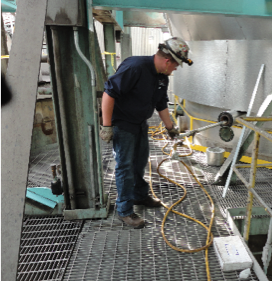 It is easy to collect fly ash samples from the economizer ash hopper. However, hopper samples may or may not be a representative sample. A high volume fly as sample collection method ensures the sample is representative of actual ash in the flue gas stream. This also provides accurate fly ash LOI information that correlates with your actual combustion efficiency. -This analysis is performed based on ASTM D3174 with one exception. In place of the typical muffle oven used for the burnout process, we use a hot foil instrument. By using this equipment in place of a muffle oven, we reduce LOI analysis time to minutes instead of hours. This method is extremely helpful during combustion tuning to provide immediate LOI results. Fly Ash LOI Analysis can be done at the SAS Global Lab or onsite in the SAS Global Mobile Diagnostic Lab seen below. Copyright 2019. All rights reserved. Alpha Industries Ltd.